I recently treated a 49-year-old female patient who complained of right medial knee pain and occasional lumbar and sacroiliac joint pain. She has been athletically active her whole life and is generally a fit and healthy person. However, at age 49, she felt like her body was letting her down. She had received medical care, acupuncture, physical therapy, and chiropractic care from a number of practitioners, but they had only provided temporary pain relief at best. After conducting a postural and movement evaluation and a series of muscular strength tests, I felt like I had determined the root cause of her problem that other practitioners, who were just treating the symptom of pain, had missed. 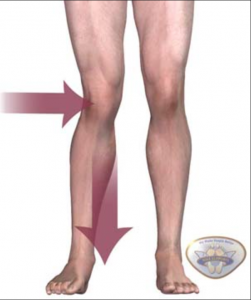 I noticed that the patient’s right hip was higher than the left, creating a left tilting pelvis, and when she performed a squat, her right knee moved in toward the midline and rotated inward, instead of staying in alignment with her foot. 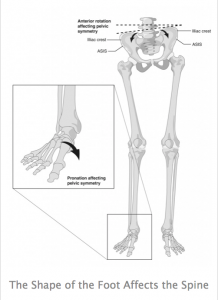 I also noticed that her right foot over pronated (which contributed to rotation of the knee and pelvis). This squatting movement triggered her knee pain. While performing this movement, she also had trouble using her right side to support her weight, and, as a result of this, she shifted her body weight to the left. This movement pattern would have occurred every time she sat and stood up from a chair, ran on a treadmill, or walked up stairs. (It was not something she was aware of until I guided her through focused, slower movements.) This compensation pattern was aggravating the joint and ligaments on the medial side of the knee and causing pain. Manual muscle strength tests confirmed that her gluteus maximus, medius, and minimus on the right side were weak. 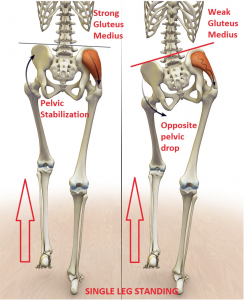 Muscle imbalances of the back and hip and/or foot over-pronation on one side can cause the pelvis to become misaligned. This misalignment can contribute to recurring lumbar, sacroiliac, hip, and knee pain. 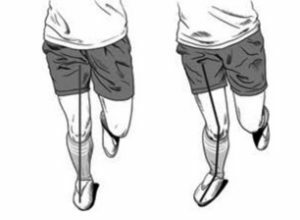 The left image below shows the correct alignment of the knee when walking and running. 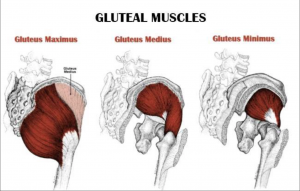 The right image shows what can happen when the gluteus muscles are weak and the foot pronates (rolls inward). Although this patient’s primary complaint was knee pain, the treatment, in this case, did not involve treating her knee directly. Instead, I corrected the misalignment of the pelvis, treated the motor points of the gluteal muscles to strengthen them, additional points to help strengthen the muscles that support the foot, and the opposing adductor muscles that were tight and inhibiting the gluteus medius and minimus. I then prescribed some exercises to further strengthen the weak muscles (now able to contract properly because of the acupuncture), release the tight muscles, and I showed her how to perform a squat properly. She could do this much easier than before treatment because the supportive muscles now worked properly. Although the patient said it has been a little frustrating to practice slow, restorative exercises (she likes to move fast), she reports a significant reduction in pain and the ability to continue exercise without aggravating the pain further. I know with a few more treatments and an ongoing commitment to correcting her alignment, she will be able to enjoy many more years of physical activity without pain. If you think you might benefit from the Sports Medicine Acupuncture approach, I would love to work with you to help eliminate your pain, create better movement patterns, and achieve your exercise goals.